Epiphany may be too strong of word. That is just the word that popped into my mind first thing this morning. I woke up with a solution to a sock problem that has been bugging me. I really like the look and feel of 60 stitches around my foot and ankle. The problem is my legs are shapely. 60 stitches do stretch around my lower calf, but I don’t like the look of the cuff. There is too much stress on the stitches. Also I had quite a bit of yarn left over from the ‘glynis’ socks. I would like to make the socks taller and use up that extra yarn. Now here is the thought I woke up with. I saw the charts I have been drawing and then I saw the extra stitches I need down the middle of each motif. Since the motifs are staggered I will be able to decrease down to the 60 stitches I like for the ankle and foot in two steps, making a smoother transition. So I took a photo of the start of my ‘Garden Spray’ socks. You can see the texture of the stitch. I like how they were coming along. Now I have to frog them and start over with a 70 stitch cast-on. Hopefully the new pair will be so much better. This entry was posted on Saturday, May 9th, 2009 at 3:00 am and is filed under Knitting. Tagged: Knitting. You can feed this entry. You can leave a response, or trackback from your own site. As someone else with “curvy calves” I can’t wait to see how your socks come out. I usually make shortie socks- one way to solve that problem! 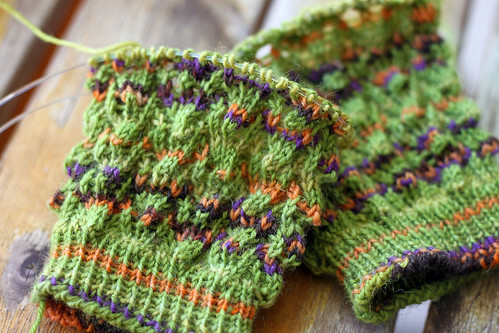 The pattern and the yarn is beautiful! Ha ha! I love your word! It’s wonderful when we figure something out. Those socks are going to be cute.